Amid the thousands of tributes paid to former President George H.W. Bush in the wake of his death, one photo has captured the hearts of people across the globe. In a snap shared by President H.W. 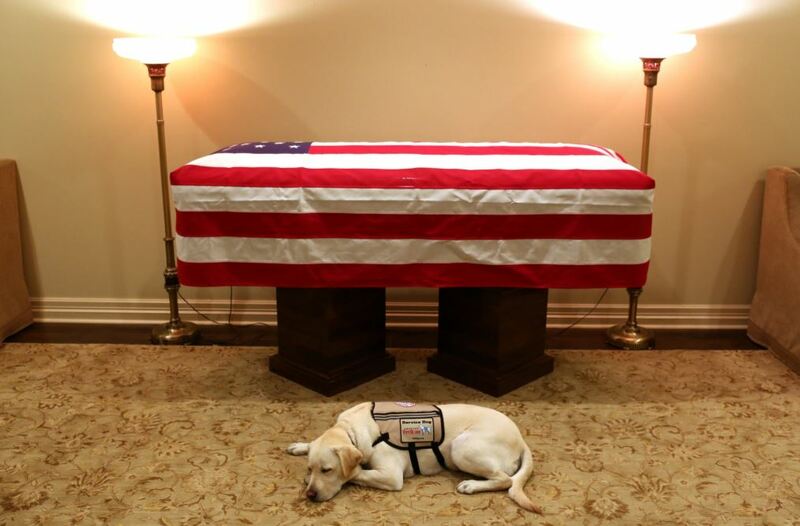 Bush’s post-White House spokesman, Jim McGrath, the 41st Commander in Chief’s service dog “Sully” could be seen lying down next to Bush’s casket, in a mournful pose. “Mission complete,” McGrath wrote in the caption. Today, Sully will accompany Bush’s casket to Washington D.C., where the President’s body will lie in state ahead of a day of national mourning. Air Force One will transport the casket, and will be temporarily renamed “Special Air Mission 41” in honor of the former President. Sully even had his own Instagram account, with snaps appearing of his various adventures at the side of President H.W. Bush. According to ABC-6, Sully will now head back to America’s VetDogs in Smithtown, New York, for a temporary stay before being assigned to serve another wounded vet as part of the Walter Reed National Military Medical Center’s Facility Dog Program. Do pray for the entire Bush family as they grieve the loss of their beloved George.